Good Morning everyone! It's Design Team Tuesday over at The Memory Nest. This week we are featuring We R Memory Keepers Simply Spring Line. I absolutely LOVED working with this line. I am not a pastel person either but these colors are just gorgeous. The paper is just divine to work with too. I really wanted the focus to be on the pictures. I love these pictures and the story behind them is one of my favorites. It really shows my daughter's personality. I kept the layout super simple. I wanted to layer it to death but the papers were so incredibly pretty that I just couldn't bring myself to cover them up. I die cut the title from my Silhouette. You can get this in the Silhouette store or at Lori Whitlock's store. I love this title...it describes my daughter perfectly. I die cut it 3 times. Once in the stripe pattern, once in the orange pattern and once in gray. I edged it with some Starfall Stickles and pop dotted it. The yellow cardstock is just regular Bazzill. It looked way too plain to me so I took Hero Arts Tiny Ink Spot Design Block stamp and inked it in Colorbox Frost White and stamped it many times over the background to give it a subtle pattern. On this page I cut the small banners out of the patterned paper and just lined them up. I also fussy cut the scallop border out. The borders are only 12 inches but because my pictures take up a good chunk of space I was able to use it on both papers. Making it appear as if I had more than I really did. This is a great way to stretch those products and make them work for you. Lastly, I journaled on vellum and placed that over another small piece of patterned paper that I cut into a tag. As you can see from the tag the bottom line smeared. I just hand wrote it in. I couldn't see wasting a whole piece of vellum for one small sentence. I think in the grand scheme of things, my daughter won't ever care that I made a small mistake on her page. I finished the layout off by adding some dimensional sticker that come with the line. All the papers and stickers can be purchased at The Memory Nest. 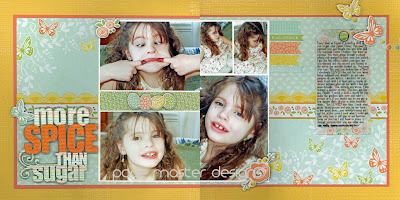 Please stop by the blog to see what the other girls have made. Thanks so much for stopping by. This is my favorite layout you have done for the Design Team so far. Beautiful work!